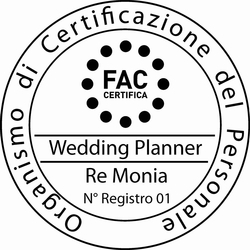 Kairòs was born in 2006 as the first agency for wedding organization in Cuneo and since 2014 Monia Re has been the first certified wedding planner in Italy. During the years we have built our reputation on honesty and ability to create elegant weddings, unic scenic designs and amazing atmospheres. Inspired byt the sense of beauty, we take care of the creative project and we customize every single detail of the nuptials. We interpret dreams and we coordinate all the vendors just like the best orchestra leader could do with his musicians, bringing together all the instruments in the same direction, creating the perfect melody. We work all over Italy and we select only the best wedding vendors on the market. Our goal is the research of perfection for each project and this helps us to get always impeccable results. Thanks to our ten-year experience in the field of luxury events and of refined weddings in Italy, Kairòs designs bespoke weddings, in the name of the perfect balance between simplicity and elegance, stripping the superflous to reach magical momenbts, those always dreamt of! 10. We are certain that we can find also what does not exhist and if we don’t find it we can purposely create it! 11. We are firmly convinced that beautiful things are priceless!